You have less than one day left to enter the raffle to win my review of your cover letter and/or resume, so if you were thinking of doing that: get on it. Time is running out. Interestingly, Petunia looks a little bit like me. But I don't have bangs. Anymore. That tree does NOT look like the tree in our backyard, though. Our tree is an avocado tree. You can pre-order it now via the publisher, Amazon, or Barnes and Noble (hard cover only- there will be a Nook book, but it isn't available for pre-order yet). There will be an iBooks version, too. The book is about Petunia, a little girl who is not at all princessy, but is surrounded by princesses. She is lonely and wants a friend who will climb trees, build towers, and play ball with her. A new family moves in next door, and Petunia is disappointed to find that the new little girl is another %$#@*! princess, but- wait for it- Penelope turns out to like to climb trees, and build towers, and ball, too. Because, you know, being princessy is just one aspect of a girl's personality. One might even say it is completely orthogonal to interest in building towers or playing ball. You may note that my daughter Petunia has a namesake in the story. The funny thing is, she doesn't know her blog name is Petunia (she doesn't know what a blog is). This story is part of Petunia's bedtime routine, just like the zebra story was (and sometimes still is) part of Pumpkin's bedtime routine. In my mind, Penelope is the clear hero of my story because she is the one who realizes that loving sparkles and bows only means that you love sparkles and bows. Petunia, though, calls it the "tuna story" and identifies with Petunia. But then, she also favors Elsa over Anna, and as we all know, Anna is the hero of that story. To be fair, I did put Petunia in the title. But Penelope, the Princess Who Knows What's What didn't seem like a very good title. Anyway- in a little less than a month you can have this book. It will be available as an ebook and a hardcover. 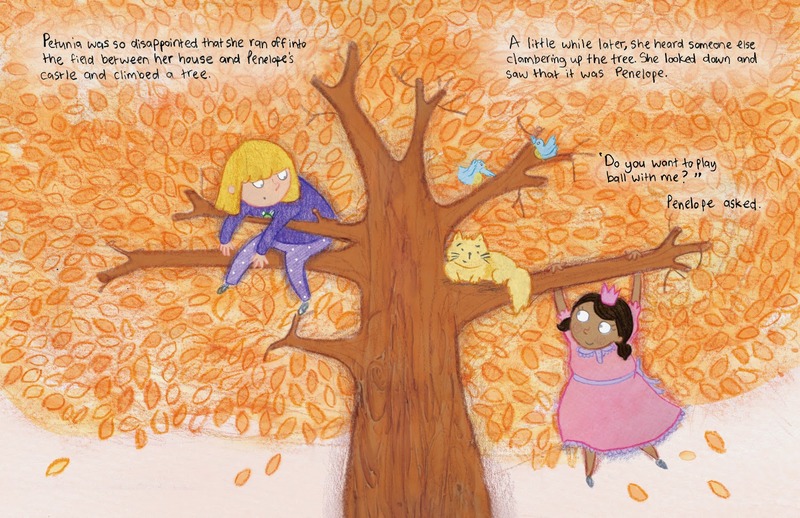 I love the illustrations, and think my message would do a lot of people (kids and grown ups!) some good to read. Also, I like money. So I'm hoping it does really well! If you'd like to help me with that, I'm looking for volunteers to review it. You'll get an electronic advance copy and my undying gratitude, and all you have to do in return is write an honest review of the book. You do not need a blog to volunteer- Amazon reviews are awesome, too. And if you end up hating the book, you're welcome to say that in your review. If you're interested in volunteering, email me at wandsci at gmail dot com, or tweet at me. Also- my publisher and I are planning our promotions for this book. One thing we'll be doing is a giveaway (or two?) associated with people talking about the book on social media. Details will be forthcoming closer to the release date, but in the meantime, start thinking about how you'd tell the world that your sparkle-hating child is #notaprincess or how your little sparkle-fiend is #notjustaprincess, because kids are unique individuals, not stereotypes. I'm not sure if I'm a good candidate to do a review from an electronic copy -- the novelty of the medium would probably overshadow the content if I tried reading it to my daughter, and she's probably a bit below the target age range, anyway at 2 years old -- but I am looking forward to the release! The idea for the zebra story came from the fact that my mom wasn't paying enough attention during the 10,000th reading of an animal picture book and blurted out that zebras said "shhhh" when Pumpkin asked her. So that's come full circle! Thanks for sharing that story. It made me smile. Very exciting! I don't live in a world where culture puts down princesses, not by a long-shot. I suspect this may be related to the ambient pressure to formula feed rather than breast-feed, the unusualness of not wanting an epidural, and so on up through not understanding women who keep working after their kids are born if they can afford not to and the weirdness of not taking a husband's name (though I get a bye on the latter two because everyone knows that PhDs are different and have different rules, which I assume is a legacy of the plantation culture). We're not yet at the backlash stage, so it'll probably be a while (decades? centuries?) before we reach the self-actualization stage that the book is targeting. I predict this book will sell well on the coasts. Oh, I have a message for the princess-loving world, too. Petunia stays NOT a princess to the end! One of Pumpkin's best friends is the least princess-y girl I've ever met. Even here is California that gets her some raised eyebrows. That drives me nuts. Congrats Cloud! Can't wait to read it. I may do a children's book write-up in October, so I can tie this in to that. I'm looking forward to this. We've resisted the princess onslaught, not because we intend to deny Baguette all things princess-y, but because we want her to know a whole world of interests that may or may not include princesses. And because we want to expose her to a range of princesses--Leia, for example. And I am delighted that Baguette clearly identifies with Anna (unless she's singing "Let It Go"--but otherwise, she is all about Anna). We resisted until Pumpkin was about 4, and then we started to feel bad that she didn't know the princess stories all of her classmates were in love with. Then, since we already had Cinderella for Pumpkin, Petunia got exposed much earlier! I've completely made peace with it. We talk about the stories and what messages are good- and we point out the ones we don't agree with. A colleague's daughter, who is about 4, has invented a character who she plays ALL THE TIME, demands stories about, dresses up as etc. - ACTION PRINCESS! Action Princess wears a tiara and a pink tutu with leggings underneath for when she hangs upside down off climbing frames, throws herself headlong into mud puddles because just splashing isn't enough, and refuses to rescue princes unless it's definitely not their own fault they have a problem. Action Princess climbs mountains to rescue kittens from caves, THEN combs their fur and puts bows on their collars. Penelope is clearly an Action Princess! My niece is currently an elf about 90% of the time because "they get to be pretty in trousers AND shoot things!" The girls I know are going to grow up AWESOME and I hope your book inspires a few more! OMG, I LOVE the idea of Action Princess! I should definitely buy a copy of your book, I'm sure we'd like it too. Side note (from tweet): Yes, sauteed cucumbers are delicious. Try with stirfry beef and a teriyaki sauce (from Help! My apartment has a kitchen!). Congratulations! This books sounds utterly wonderful. My youngest is a tomboy, has always been one, loves Legos (she's one of only a few girls in her Lego class this month. For a long time she refused to have anything to do with princessy, "girlish" type dresses and things. And then suddenly she flipped to liking dresses and pretty hair clips and Frozen. But she still likes cars and trains and playing with boys, too. I think she would really like your book! So yeah, I'd love an advance e-copy. . . more to the point, I think my daughter would, too. Thanks for writing a book like this. Your daughters must be thrilled! Awesome! I'll email you to sort out the details. The book is going to be a birthday gift for Petunia, so although she knows that "the tuna story" is getting turned into a book, she hasn't seen it yet. She keeps asking when it will be a book, so I am very excited to give it to her next week! What a great birthday gift! Happy birthday to her! Yay! Congratulations! Looking forward to seeing the book! And I've got a nearly 5-year old boy who wants to be a princess and loves all things pink & sparkly and twirly. He also likes climbing and bikes and super heroes. I don't know what any of that means. Just that I think we need to expand even beyond "girls can be NOT princesses" to even more fluid thoughts on gender in young children. Ana, there are some fantastic younger children's books these days for supporting gender creative boys and girls. "Jacob's New Dress" by Sarah and Ian Hoffman, and "Roland Humphrey is Wearing a WHAT?" by Eileen Kiernan-Johnson, and "I Am Jazz" by Jessica Herthel and Jazz Jennings have all been favorites at my house. Highly recommended. For grown-ups wondering "what any of it means" (even for grown-ups who are parenting gender conforming kids) I recommend the excellent book "Raising My Rainbow" by Lori Duron (and her blog by the same name of course). I absolutely agree. In some ways, we give our boys even less leeway than our girls. This story started as a bedtime story for my daughter, so it was sort of natural to make it about girls, but my NEXT book is about a little boy who goes to superhero school and is worried because he can't find his super power, and then (through a series of events) discovers that his super power is dance. I am almost ready to send it out to beta testers. Would either of you be willing to be a beta tester? It comes with my undying gratitude and a free copy of the finished book. If you're willing, send me an email (wandsci at gmail dot com). That sounds like an amazing book! I would be honored to beta test it - look for an email from me soon. @Ana - I have a friend whose son also loves princesses and sparkle, and she often posts adorable photos of his creative outfits on Facebook and I have not seen one disparaging comment. Which isn't to say those people aren't around, but I like to think it's changing a bit and she's doing her part to help people realize it's ok for kids to like what they like. Thanks for the recommendations hush, I will look into those. And I will email you Cloud, I'd love to read your new book.